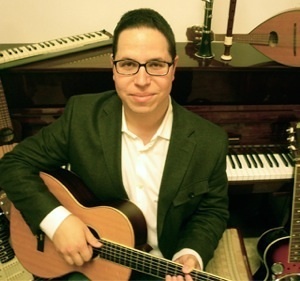 Born in 1982, Dory Bavarsky began his musical education at age 5. As a teenager he received annual scholarships to study classical piano at the Southern California Conservatory of Music. He attended the College of Creative Studies at the University of California, Santa Barbara, where he earned a degree in music composition. Dory’s training as a classical pianist, and his studies of the history of compositional styles and techniques, both helped to cultivate, shape, and inform his improvisational process as a Jazz player. Dory is an active professional pianist, and his work spans many genres, including Jazz, Classical, Pop, and Musical Theater. His main musical passions, though, remain Jazz and improvised music. As a composer and pianist, he leads and performs with several Los Angeles based Jazz groups. In May 2010, his jazz trio performed as semi-finalists in the 4th Bucharest International Jazz Competition in Romania. In September 2010, the group won 5th place at the Hoeilaart Jazz Competition in Belgium. In October 2010, Dory performed as a semi-finalist in the Nottingham International Jazz Piano Competition in England, and the Martial Solal Jazz Piano Competition in France. Following his studies, Dory returned to Los Angeles and began working as a composer for film and television productions. His music is featured on many prominent television programs, commercial music libraries, and independent films. His television credits include The Oprah Winfrey Show, Guiding Light, Entertainment Tonight, The Insider, UFO Hunters, MTV’s Next. In 2007 he received an Emmy certificate for his contributions to the CBS drama Guiding Light. He has been an ASCAP member since 2005, and received ASCAPlus awards in 2010 and 2011. In addition to his work as a performer and composer, Dory is an avid music educator. Dory maintains a private teaching studio, and is a director at Southern California Conservatory of Music. As a part of the school’s Braille Music Division, Dory teaches children with visual impairment and other disabilities. He conducts music outreach programs for students with severe to moderate disabilities in the Los Angeles Unified School District.